Thank you for all your compliments on the Seamless Hybrid. I must confess that I think I'm prouder of it than I have been of any other knitting project I've completed; I caught myself looking at my husband -- well, at his sweater, anyway -- all throughout Thanksgiving dinner and petting him whenever he came near. The family and friends were much impressed, and my uncle even asked me if I would knit a sweater for my aunt -- the very same aunt who taught me to knit many, many years ago! That was a request to which I could not say no, so there will be some yarn acquisitions in the future. 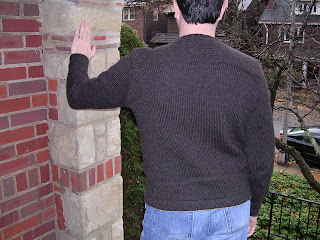 I'm thinking another EZ seamless sweater, perhaps a stranded yoked design. Any and all ideas are welcome. Since then, I've been working on some items that might shock you if you're familiar with the types of things I normally knit. This Friday is my office's second-annual hallway sale to benefit the United Way. Last year, most people brought in odds and ends they had around the house, and I brought in a bunch of novelty yarn scarves I'd knit for fun with no intended recipient in mind. People just went crazy for them! So this year, I decided to make good use of the freebies that were in the Stitch 'n Pitch goodie bags. I'm hoping people will shell out some big bucks for these, especially as it's for a good cause. The benefit for me? I'm finally moving all this novelty yarn out of the stash. What better way to show my husband how thankful I am that he's in my life than by knitting him a sweater? I am thrilled with how this sweater turned out. I finished it last night at Hurricane Knitters and promptly tried it on; the girls made me go to the ladies' room to look at it in the mirror, and I must admit that for a moment I was seriously tempted to keep it for myself. The moment passed, however, and The Mister was happy to have it to wear to Thanksgiving dinner this evening, where it was much admired by the rest of the family and friends who were there celebrating with us. I started this sweater with a swatch using three different needle sizes and asked The Mister to pick the fabric he liked best. It ended up working out well, as he picked the needle size that just happened to work out for using the numbers EZ gives as her examples in KwoT -- a 40" chest size and a gauge of 5 sts/inch. 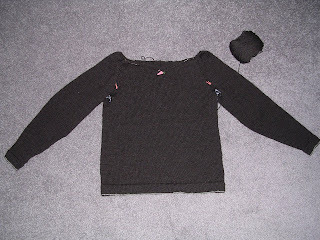 It made for minimal math to complete the sweater, which was extremely helpful considering this was my first adult-sized, designed-to-fit EZ sweater. It was tricky enough to figure out how to get all the pieces to fit together (figuratively, of course) without worrying about my math skills. What you can't see (because I was a little absent-minded and forgot to take any pictures) are the contrasting hem facings. I used some light gray Cascade left over from The Mister's Cambridge Jacket and followed Jared's directions, for the most part. I did make one modification, and that was to use the contrasting color for the increase row right before the purl turn row. This allows a little bit of the gray to show at the bottom hem and the cuffs, and I thinks this adds a little interest to an otherwise pretty neutral and plain sweater. 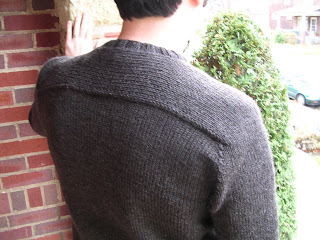 I think my favorite part of this sweater is the saddle shoulder. I opted to carry it along the back (so that it looks like one strip of fabric that's perpendicular to the rest of the body) instead of a third saddle in the middle back. The actual knitting of the saddles was a bit tricky, what with the circular needle holding the front and back stitches and a couple of dpns used to work the shoulder stitches back and forth. Tricky and awkward, yes, but not difficult. It was the one part of the sweater I was most worried about, but in the end it turned out perfectly. 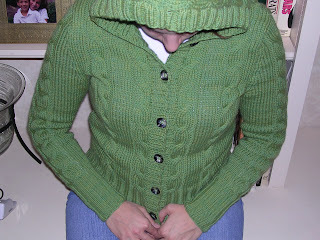 I used a simple 2x2 rib for the collar, which thankfully did not need to be reknit. It's a tad bit snug going on, but it hugs the neck nicely, preventing any chilly air from getting in. Overall, this project is a winner as far as we're both concerned. I loved this pattern and will definitely be knitting other versions of the EZ seamless sweater in the future. While on paper it looks like it took a long time to knit this, in reality it was a pretty fast knit; I was knitting several other projects at the same time (including a sweater for myself) and the appendicitis and subsequent hospitalization greatly cut into my knitting time. What really amazes me most is how little yarn, relatively speaking, I wound up using. I had started with seven skeins and started worrying it wouldn't be enough soon after I joined the second skein for the body. It's nice to know that I can knit the same sweater again and won't have to overestimate my yarn needs -- and I can knit myself one with some 220 I already have in the stash! I hope you all had a great Thanksgiving (if you were celebrating) and had as warm and cozy a day as we did! As of last night, the yoke of The Mister's Seamless Hybrid was complete. You know what this means, don't you? Tonight I get to start the saddle shoulders! My numbers are a little off from EZ's, but I'm making it work and I'm having faith that all will work out. My (perhaps insanely ambitious) goal is to finish this up in the next couple of nights so that, following a steam block, The Mister can wear it to Thanksgiving dinner and show off my mad skillz to all my relatives -- among them the aunt who taught me to knit many, many years ago! Regardless of whether or not I meet my goal, I promise that the next time you see this sweater it will be more interesting than a brown blob on the floor. Today The Mister was kind enough to take me to Natural Stitches, since I wasn't able to make it for the grand opening yesterday. The shop was very well stocked and everyone was very friendly; Martha greeted us when we came in and pointed The Mister in the direction of some comfy chairs at the front of the store. He waited patiently for me while I had a bit of a falling down in the Malabrigo aisle. I picked up a couple skeins of sock yarn and was slightly tempted by the wall of Cascade, but in the end I just couldn't resist the kettle-dyed colors of Uruguay. My real undoing was the aisle containing many gorgeous colors of the worsted weight. In the end, I decided on a colorway called Dusty Olive. Unfortunately the overcast sky and poor indoor lighting have prevented me from capturing the true beauty of this colorway -- in real life, it's a beautiful combination of a dusty rose and a deep olive with shades of chocolate brown. 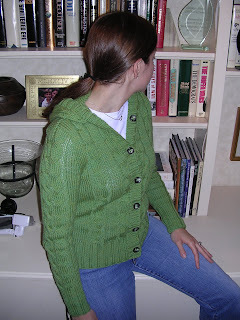 I bought six skeins, a real splurge for me, that will become a Sunrise Circle Jacket (pdf) provided I can get gauge. 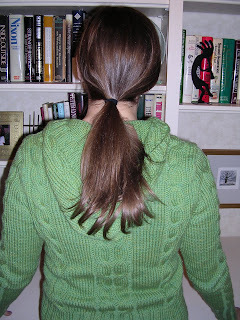 Of course, that's only for knitting after the long-awaited Tangled Yoke Cardigan. The good news is that I should soon be ready to cast on for the TYC. 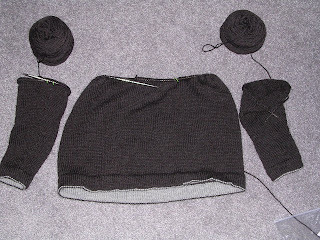 Last night I "finished" the second sleeve of The Mister's Seamless Hybrid, so there's only about two or three inches left to knit on the body before I join all the parts and begin the interesting part. I've gotten to the point where all I want to knit is his sweater, so I'm anticipating another week or less is all I need (especially considering there's a long weekend coming up). If I'm really good and really productive, maybe he'll even get to wear it to Thanksgiving dinner! These are for my mother-in-law, who luckily has feet very nearly the exact same size as mine, which makes it very easy to knit socks for her (and even easier to model them for blog pictures -- don't worry, they'll be washed before she gets them). Would you belive that this LLSS is the very first Lorna's I ever bought? It was an impulse eBay purchase about two years ago, and it had been sitting in the stash waiting for the right pattern ever since. It turned out to be perfect for this pattern, just so long as you don't look too hard at them while intoxicated. There's not much to say about this pattern that I haven't already said. I think I've gotten the Monkey business out of my system for a while, but these definitely won't be my last pair. As soon as these were finished I cast on for what I'm calling Very Boring Socks Indeed -- plain stockinette socks in navy blue, for my father, by request. Only for someone I love would I knit such a boring sock! At least it will go quickly -- and at least my father's feet aren't as long as my husband's. Thanks for all of your compliments on the CPH! I am resisting the urge to wear it every day, that's how much I love it. I definitely want to knit another one -- someday --in a larger size for more of a sweatshirt feel, but for now I'm very happy with a snug cardi. We're definitely getting close to the point where I join the sleeves and the body, and now that this is the only sweater I'm working on, I can give it my full attention. One of my coworkers (the same one for whom I knit a sweater earlier in the year) recently opened a gallery downtown where she sells her self-designed jewelry along with artwork and other hand-made items, and she asked me to knit some things for her to sell. With all the holiday knitting I've been doing, I couldn't really commit to any big projects, so she asked me to do some ornaments. Everything you see here will fit in the palm of your hand, and all were knit on 2.25 mm needles (Knit Picks Harmony dpns, to be exact). 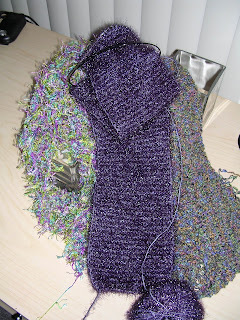 The red and green sock is worked over 24 stitches, the purply one over 18. These are fast, satisfying, and (I hope) popular with her customers. The best part? Well, they use up some of my huge bag of sock yarn scraps and they really help assuage the urge to cast on a new project! I really wanted to do an outdoor photo shoot for this FO, but I couldn't wait any longer. You'll just have to deal with my parents' living room as the backdrop. I am absolutely in love with this sweater. I think it says a lot about a pattern that as soon as I was finished I wanted to knit it again. 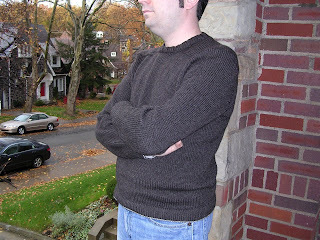 There are several things I'd change if I knit this sweater again, however. The first thing would be to knit the next larger size. I knew that others who'd knit this sweater had found it to run small, but I wanted a fitted sweater, so I knit my normal size. It fits perfectly, for the most part, but as you can see in the photo below, the lower arms are a little snug. I have the pull the sleeves on, but once they're on, they're not uncomfortable. I wore this sweater all day and didn't really notice. Still, it would be nice to be able to wear a looser shirt underneath the sweater and to have a little more room. The other thing I'd change is the decreases on the hood. It bothers me that they're not centered, and that's a little apparent because of the fact that I grafted the hood stitches instead of binding off and seaming it. Next time, I'll adjust the decreases so that they are actually in the center of the hood. I used almost every bit of five skeins of Cascade, which was really quite amazing, in my opinion. That included a swatch (which thankfully gave me spot-on gauge on the first attempt) and yarn for seaming; there's a little left over for repairs or reinforcement if needed in the future. Once again, it proved to be the perfect yarn -- great color, great yardage, great stitch definition. I still have five more skeins of this same color in my stash, along with five skeins of a shocking pink that was in the same WEBS order. I used six buttons, all sewn on with sewing thread and then covered with a bit of yarn (somehow I must've had the subconscious foresight to buy buttons with extra-large holes). This sweater marks an important step in my sweater-knitting career: With this sweater, I officially conquered my fear of the set-in sleeve. These sleeves were the easiest to sew in of all the sweaters I've knit so far, but getting them in perfectly on the first try was a huge confidence boost. I swear that from this moment forward, I will not be scared of sweaters with set-in sleeves! Now that this is finished, I will turn my attention to The Mister's sweater, which has been languishing for quite some time. It might not be as fun a knit as the CPH, but at least there will be no seaming to deal with at the end. And finishing his sweater means I'll allow myself to cast on for the next sweater for me! We had our usual good time, and towards the end of the evening we got a bit punchy. But it was just what I needed to cheer me up after a stressful day at work. What also helped were the packages waiting for me at home. 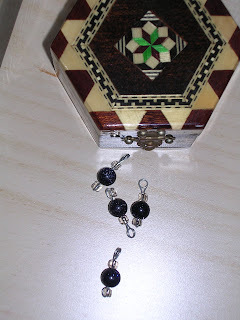 My less-than-stellar photography skills have failed to capture the real color of the beads -- a beautiful indigo with an underlying silvery sparkle. The other package was a shipment from Knit Picks. The original reason for the order was to get the book (you know, since I had the stitch markers all ready) and some navy sock yarn for the socks my father requested. Then I decided I really wanted to try some Felici, and then I noticed that there was some Shine Sport on clearance (for less than $10, it'll make another Pea Pod set!). 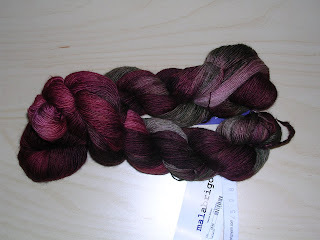 At that point I was so close to the free shipping, I threw in a skein of Telemark with no particular project in mind. I'm sure I can find some use for it -- suggestions, anyone? I got a surprise package in the mail today, from Miriam. Inside was my Adamas, which she'd borrowed to photograph. As a thank you, she sent me two jars of homemade jam. Yummy! Thanks, Mim! More no-purl Monkeys, in Lorna's Laces. Would you believe this is the very first Lorna's I ever bought? It's been living in the stash for a couple years now; I thought it was about time I used it. 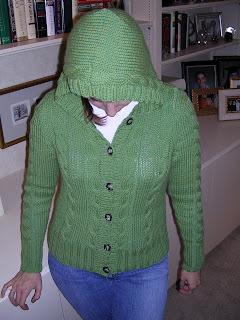 My Central Park Hoodie is finished! Unfortunately, it's a tad bit tight, especially in the lower arms, so I'm going to have to try some serious blocking. I'm also sorry to tell you that you're going to have to wait a couple days to see it; this sweater really deserves a proper photo shoot, and these days all the natural light is during the day when I'm at work. So I'll have to wait until Saturday for the full write-up. For those of you who can't wait to see the finished sweater, I'll be giving a little preview of it tonight at the meeting of the Hurricane Knitters, Waterworks Barnes & Noble, 7 p.m. Hope to see you there! They're a little on the square side, which I really like, and what you can't see from the picture is that they're pretty three-dimensional. 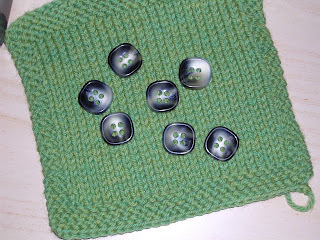 I bought all seven buttons that were left in the box, although there will only be six on the sweater. Last night I finished the second button band, so tonight the Adventures in Seaming begin! In other news, I won a blog contest! Devorah and her family are avid bikers, and months ago she held a contest in which all entrants had to guess how many miles they would log on their bikes by October 31. 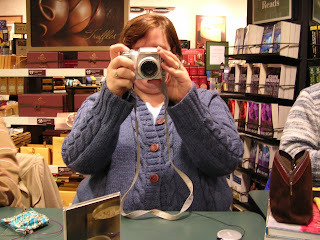 I wound up being a mere four miles off, so she will be sending me some sock yarn and some chocolate for my lucky guess. I somehow managed to not check my e-mail at all over the weekend, so it was a nice surprise when I checked this morning. Other knitting news? I know this will a huge shocker (can you sense the sarcasm in my voice? ), but I started another sock. It's the first of a pair of Monkeys for my mother-in-law for the holidays. Not much is done other than a cuff, so I won't bore you with a picture of ribbing. Sorry for the short post; it's been all CPH all the time here, and I am determined not to show you another picture of the darn thing until it's done! Let the seaming commence! Lookie here! I finally managed to finish a pair of STR sock club socks before Pat! I absolutely love these socks, even though they're a bit on the snug side (they're 60 stitches around as opposed to my standard 64). 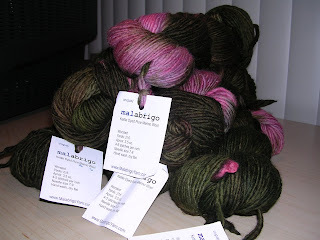 This was the first shipment in the sock club where I loved both the yarn and the pattern. It was easy and fast, and I really only had to pay attention to the first 22 rows. Did I mention that I re-upped for next year for the sock club? I wasn't going to -- not because I didn't want to, but in an effort to save some more money -- but then The Mister offered to get me my membership as my Hannukah/birthday gift. You can imagine how quickly I said yes. Thanks to the sock club, I'm going to have to say Socks That Rock. It's soft, it holds up well (or it has so far), and the colorways are always gorgeous. 2. What’s your favorite type and brand of sock needle? My most-loved needles are my 12" US 1 (2.5 mm) Addi Turbo circulars. I've used them so much, the silver finish has worn off in several places. Lately, though, I've been quite enamored of my 32" US 1 Knit Picks circular for magic loop. 3. Do you knit your socks toe up, cuff down or sideways? Most of the time cuff down. I see the appeal of knitting toe up to maximize yarn usage, but the cuff is never comfortable and the socks never fit quite as well as cuff-down socks. 4. Do you knit both socks at once or just one at a time? One at a time. 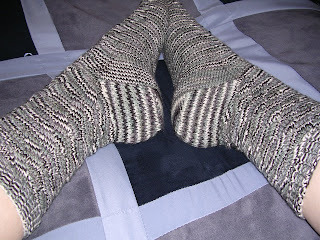 I knit one pair both socks at once and hated how un-portable they were and how much time I spent detangling the yarn. 5. What’s your favorite toe and why? Just the standard wedge/wide toe, for the simple reason that it fits my toes the best. I'm a heel flap and gusset kind of girl. It may take longer than a short-row heel, but it fits oh so nicely. 7. Do you prefer plain or patterned socks? Depends on the yarn. For a really busy variegated yarn, a simple stockinette is usually my preferred pattern. 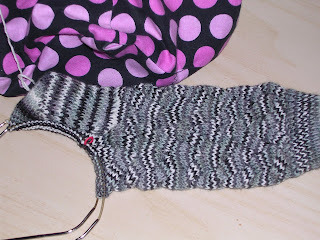 But patterned socks can be such fun to knit, as long as the colorway doesn't compete with the pattern. 8. Who do you knit the most socks for? 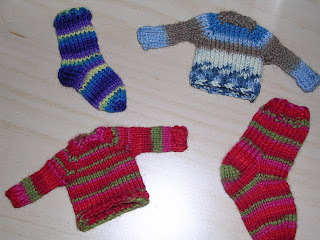 I'll admit it: I'm a selfish sock knitter. Most of the socks I knit are for me. But I knit a fair amount for The Mister as well. 9. Do you darn your socks? If not, what do you do with them? So far, not yet. I've only had one pair wear out thus far, and I just haven't gotten around to darning the holes yet. 10. Do you only wear handknit socks? In the winter, mostly. It does depend on what type of shoes I'll be wearing -- handknit socks just don't go well with tennis shoes. Considering how many socks I've knit in the past year, I'm hopeful that this winter I'll be able to wear handknit socks pretty much any day I want to. 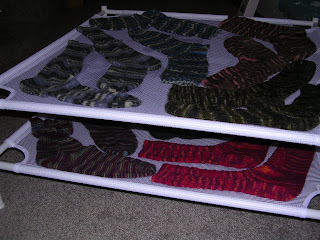 Bonus Question: What pattern, if any, is your basic “I-just-need-a-pair-of-socks” sock pattern based on? Do you keep it written down or memorized? Although it's almost identical to the Yarn Harlot's basic sock recipe, I perfected my own standard stockinette pattern way before I read Knitting Rules. Mine is 64 stitches, all stockinette with a 2x2 ribbed cuff and a wide toe. Easy peasy and fits my foot perfectly. I'm sure this has worked its way around to most of the sock knitters I know by now, so if you want to do this meme and haven't yet, consider yourself tagged! Just leave me a comment about it so I can read your responses! 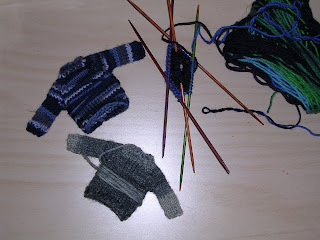 You all gave me a hard time*, so I put down the baby sweater and got back to work on the CPH. And do you know what this is? It's a nearly complete hood. 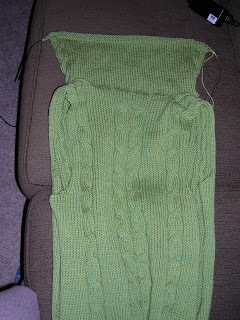 I'm hoping to finish it tonight, which will leave only button bands and seaming. There's still one major decision to make: button or toggles? What do you think? It's still supposed to be pretty chilly tomorrow (and my office is still frigid), so guess what I'm wearing for the first time? *You know I'm only kidding, right? I actually do appreciate the kick in the pants I needed to finish this sweater. My love for it has come back to me and I'm actually even looking forward to seaming it now.